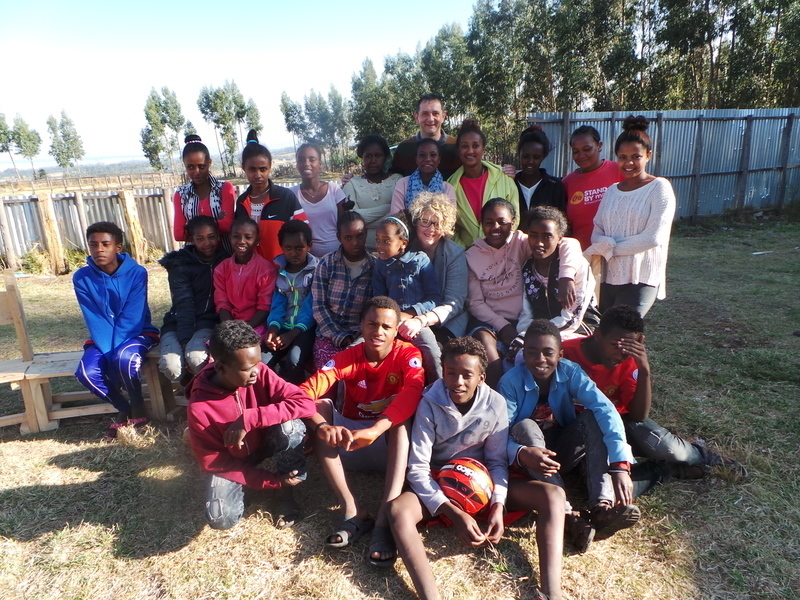 In 2012 Chris and Fi Mellor first visited Ethiopia, little did they know that this short trip would be the catalyst for them, in 2017, to move hundreds of miles away from their home to live in Bekoji, one of the poorest towns in Ethiopia. On their first trip in 2012 Chris and Fi visited the Bekoji Children’s Village and met the amazing children who despite coming from terrible circumstances, some orphaned and some abandoned, now had hope and a loving home. This trip was the first of many as Fi and Chris could not stay away from the remarkable children and felt passionate about supporting them, encouraging them and helping them feel loved. In the following years they came back with family and friends of all ages and skills, to spend time with the children and take part in projects to benefit their lives. When Chris and Fi weren’t in Bekoji with the children in Stand by Me’s care, they were fundraising at home and telling more and more people about how they can support children for whom life is hard and give them a helping hand so that they can thrive. Chris and Fi personally took on the role of advocating for our children and have consequently changed many children’s lives, finding them sponsors to support their individual needs. Each trip they took to Bekoji, and the more they became involved in Stand by Me, caused them to feel it was time for a new adventure. In September 2017 Chris and Fi will be moving to Bekoji, Ethiopia on a permanent basis, becoming part of the Stand by Me team. Fi will be the Director of Childcare Development and Chris will be the Project Development Supervisor. “I’m into all things ‘Pinterest’. My profile tells me I have 1.8K pins and my boards are made up of images of things such as home décor ideas, diet tips and in light of our daughters approaching wedding- mother of the bride outfits! I do however collect my largest amount of pins on my ‘Quotes’ board. As I browse through these there is a common theme displayed; Dreams, Faith, Passion and Africa. I guess for me those words are all intertwined. Many of these quotes talk about living out your passion, going after what gives you goosebumps and being where you are most alive. For me, it is Bekoji. From my first visit in 2012 it became part of me, somewhere I had to keep returning to. I told God this was where I wanted to be but never in my wildest dreams did I believe He would answer those prayers! I count it a privilege to have been chosen by God to go. Will it be easy? No. Will it be worth it? Absolutely! I love the children there dearly and can’t wait to do life with them. I want to help them realise how very precious they are; help them to see that God has a plan for their lives; to help them dream big and have bright futures full of hope. God is pretty awesome. I’m a little bit scared but also very excited at what lies ahead. From a worldly point of view this makes no sense. We are giving up the security of a home and good jobs but we know that God is calling us and trust Him to provide for all our needs. This big move comes with challenges. Funds are needed for initial set up costs as well as for ongoing support. In addition to support provided from Stand by Me, Chris and Fi have a target of £15,000 per annum to make this all possible. If you would like to support Chris and Fi, you can visit their page here.